The second son of Kiara and Kovu, I've drawn him with his boyfriend Haja a few times now I'm not too sure whats happening here, I feel Roho is contemplating his feelings for Haja. His parents are unaware of his sexuality and he is never sure how to tell them. Aug 25, 2018 What should i draw?? May 26, 2018 Throw your ideas at me!!! May 11, 2018 Lion KING COMMISSIONS OPEN!! 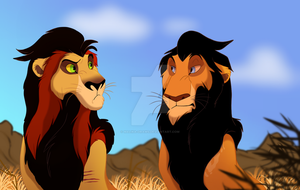 I would like to thank you for liking my The Lion King - Nala and Scar illustration, I really appreciate it. oki, is less for a lion king oc? ?